On the 1st of November, with Scarlet caught and the disaster averted, Tippens decided to hand out prizes to those who had helped catch the monster. You can also view the hidden epilogue, see what became of the monster by clicking the mountains in the background here! The following items were awarded for participating in the event to some degree. Exact criteria for who won what is not clear. Participants were either awarded 2,500, 5,000, 10,000 or 15,000 Neopoints as well. The Monster Hunting avatar was awarded to some Neopians who took part in the event. Exact requirements are unknown at this time. 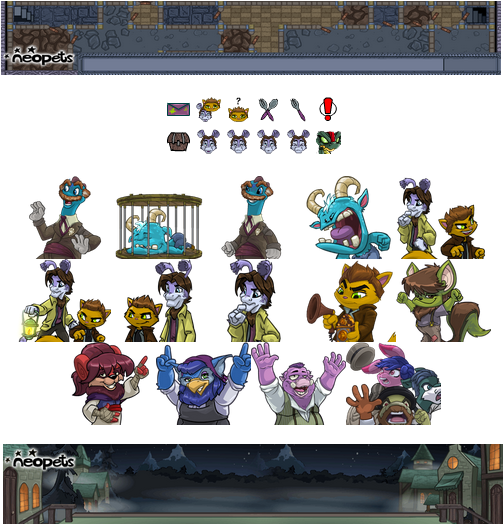 The Monster Hunting site theme was awarded to all Neopians who participated and completed at least one step.